Russian President Vladimir Putin speaks during a joint news conference with Hungarian Prime Minister Viktor Orban following their talks at the Kremlin in Moscow, Sept. 18, 2018. 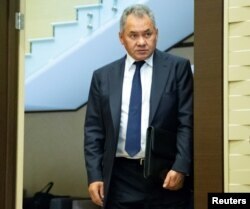 Russian Defense Minister Sergei Shoigu told his Israeli counterpart, Avigdor Lieberman, that Israel "bears full responsibility" and that Russia had the right to retaliate. Russian Defense Minister Sergei Shoigu attends a meeting of President Vladimir Putin with Turkish President Recep Tayyip Erdogan in Sochi, Russia, Sept. 17, 2018. But Putin stepped in, calling it "a chain of tragic, accidental circumstances." He said Russia would respond by "taking additional steps to protect our servicemen and assets in Syria." He said "everyone will notice" those steps. The Russian defense ministry said Israel's warning came less than a minute before the airstrike. It accused the Israelis of using the Russian plane as a cover to avoid Syrian air defense systems. While Putin did not appear to blame Israel outright for causing the Russian plane to be shot down, the Kremlin said it told Netanyahu that Israel had violated Syrian sovereignty and urged it "not to let such situations happen again." President Donald Trump speaks during a news conference with Polish President Andrzej Duda in the East Room of the White House in Washington, Sept. 18, 2018. 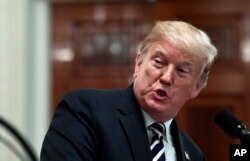 President Donald Trump told reporters at the White House that, based on what he had been told, Syria shot down the Russian plane. He called the deaths of those aboard "a very sad thing." Trump took a moment to say the United States has done a "tremendous job" in helping eradicate Islamic State from Syria and said "we are very close to finishing that job." Russia also has healthy relations with Iran, Israel's archenemy.